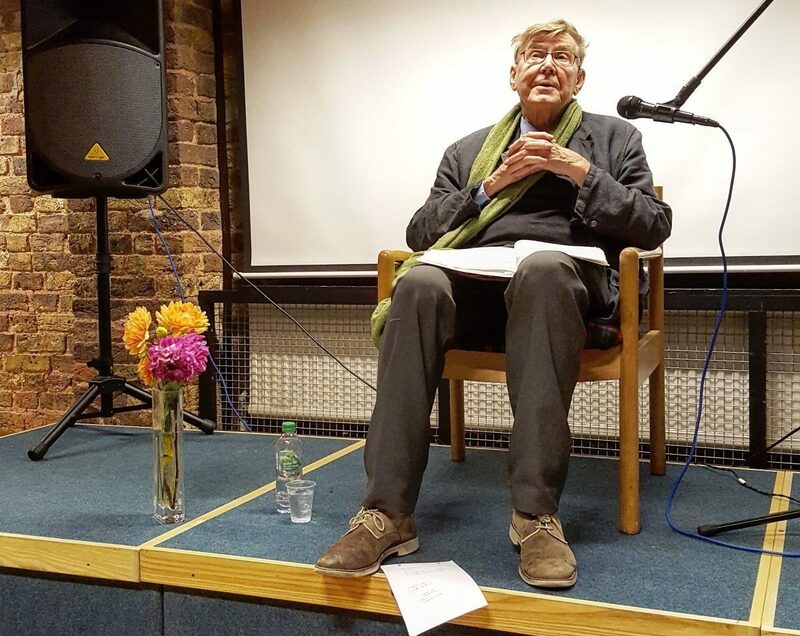 Alan Bennett looked very much at home as he took a chair and announced that he planned to read passages from his famous diaries. The diaries, extracts of which are published annually in the London Review of Books, are repositories for accounts of noteworthy events, dialogue and characters which represent the oddity and truth about humanity. It is this feeling for people that makes him such a loved playwright. What was so enjoyable about the many amusing stories that followed was that Alan Bennett, always so modest, very much enjoyed telling them. His first topic was trains, as he and his partner Rupert frequently catch the train to Leeds, his home town, and on to the house which his parents bought on retirement. It would be wrong to steal his stories, but it is hard to resist recording his encounter with TS Eliot at Leeds station. It was late in Eliot’s life and he was in a wheelchair, accompanied by his wife Valerie, whom Alan Bennett recognised as a customer of his father. Valerie Eliot later passed on to him a Beyond the Fringe programme in which Eliot had written appraisals of the show (which Bennett produced, along with Dudley Moore, Peter Cook and Jonathan Miller), among them ‘Brilliant’ and ‘Juvenilia’. Only two days previously at the Library’s film club, the film of Bennett’s The History Boys had been introduced by Nicholas Hytner, his great friend and the director of his plays and films. Hytner said that when they were interviewing for the cast, they were so taken by James Corden that they included him even though there was no part written for him. Alan wrote a hilarious script for James Corden as Timms, from which his career took off. Alan gave us 45 minutes of gripping entertainment, as testament to his insights, truthfulness and honesty. As further evidence, he declined Maureen’s gift of champagne, but was happy to take a bottle of red wine!